Laurel Rowse chose to major in chemical engineering at Northeastern University because of her love of chemistry and math. 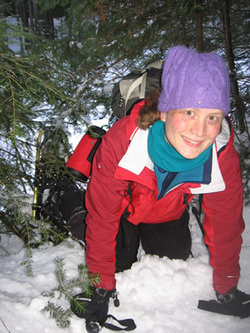 During her time at Northeastern, Laurel became involved in Engineers Without Borders, which piqued her interest in environmental engineering, sustainability, and engineering for developing communities. Additionally, Laurel studied abroad in Bilbao, Spain, where she learned to speak Spanish fluently. Upon graduation from Northeastern with her Bachelor of Science in Chemical Engineering, Laurel continued to pursue these interests by volunteering with a non-governmental organization in Honduras for two months. After returning from Honduras, Laurel considered joining the Peace Corps and graduate school for environmental engineering. She decided to join the Master’s International Program at University of South Florida and to serve in the Peace Corps as part of her Master’s education. Laurel served as a Water and Sanitation Engineer in the Dominican Republic. She designed and built gravity-fed drinking water supply systems for small communities. Her host community in the D.R. further alerted her attention to indoor air pollution and the extreme needs in many rural communities in developing countries for alternative fuel sources, efficient heat transfer in cooktops, and exhaust ventilation systems (chimneys). Cooks in her community, mainly women, cooked over three stone fires of firewood with little or no ventilation. Combining her interests with her host community’s needs, Laurel chose her thesis topic, Design of Small Scale Anaerobic Digesters for Application in Rural Developing Countries.